The New Horizons name thing was totally free to sign up for, as it was for a couple of recent Mars missions. I'm what you call a "Grey" from a far away star system, so I'm really getting a kick out of these replies. What is so "huh?" about a picture demonstrating that we ingest liquid and solid nutriets through an oriface as opposed to some other method? Carl Sagan actually tried to reach out to minds we don't know and may never meet. I'm thinking we could build a better teaching method for measurements now, but if 'they' are smart enough to pluck Voyager out of the stellar medium 'they' will certainly be smart enough to figure out what is meant. They should have included some kind of message that it woiuld be better to just stay away because whomever they are, some club of idiots here, there's always one, is going to want to kill them. That's who we are. We could have been nice and told them, but honesty is not our strong suit. Still a worthy effort from a Pale Blue Dot. Godspeed Professor Sagan! Unfortunately, it would be EXTREMELY unlikely that these are ever found. For one thing, while there are indeed very many solar systems and planets out there, most people have no idea just how unlikely the Earth is. To have a planet that would give birth to humanoid sapient life (the kind most likely to understand such a message), not only does it need to be the right size, the right mass, the right distance from its sun, etc., but it also needs to have ONE and ONLY ONE moon of proper size and distance. Why? Because land animals evolved from sea animals in tidal pools. For that, you need regular, predictable tides of moderate height. More than one moon and you get tidal chaos. No moon means no tides. Our moon was a freak accident caused by another planet-sized object striking the still-molten Earth and knocking a huge chunk of the area now known as the Pacific Ocean basin. But if that hadn't happened, or it had happened differently, we would very likely never have evolved. That's just for starters. You also need a magnetosphere to protect life from the solar wind and cosmic rays, which would otherwise snap DNA chains like a bullet through a spider web. That means a solid iron (from the pressure) inner core surrounded by a liquid molten iron outer core. That also puts a time limit on the evolutionary process: eventually the Earth's liquid core will solidify, and that will be the end of the magnetosphere and the end of life on Earth as we know it. For primates to evolve even remotely like they did on Earth, a single cosmic or gamma ray has to pass through space over the years, avoiding all obstacles in its way (cosmic dust, other solar systems, etc. ), pass through the magentosphere and atmosphere that blocks most such radiation, at the exact time so that the planet has reached that spot in its orbit, oriented in the right way, so that a predecessor of the primates is at the right spot so that the cosmic ray or other ionizing radiation particle hits a certain exact spot on the DNA chain of a reproductive cell (ovum or sperm) in that animal. The result is a DNA error that prevents Vitamin C from being formed as it is in nearly all other warm-blooded animals, except for all primates and a very few other exceptions. We primates have everything we need to make our own Vitamin C. We have the same organs, the same cellular factories within the cells of those organs, etc. to form Vitamin C, but due to that DNA error, our factories just don't WORK (this, by the way, is absolute PROOF of evolution and DISproof of both Creationism and Intelligent Design). Because our ancestors stopped making Vitamin C, they needed to get it from their diets. That meant evolving to an arboreal (tree-living) existence since the most ready source of Vitamin C is in tree-borne fruits. That meant evolving hands with basic grasping abilities (if not truly opposable thumbs early on) to grab tree branches, binaural stereo vision to judge distances accurately, color vision to tell ripe fruit from unripe, and a big brain to coordinate all of this. Eventually, the apes left the trees and lost their tails, but the basics all happened because we can't make Vitamin C, and that was because of an INCREDIBLY unlikely happenstance. Even if all of this and much, much more just happened to happen again on some other planet, there’s still the TIME factor to consider: the Universe will live in its current star-supporting phase for tens of BILLIONS of years. Our whole civilization's existence is measured in the mere thousands, and that's going all the way back to before writing existed! We’re less than an EYEBLINK. Even if we continue on for a million years or more, and achieve interstellar space travel for most of that time (unlikely thanks to Hubbert's Peak — look it up, but I warn you, it’s REALLY depressing! ), that’s still not even a tenth of a percent of the lifespan of the Universe. What are the odds of another civilization coming into existence to OVERLAP ours, so that we could communicate and co-exist? I would argue that primates lost the ability to produce vitamin c after moving into the trees as it became unnecessary to do so anymore thanks to a diet rich in vitamin c. I thought evolution was a process of making staggeringly more mistakes than successes so isn't it then just a matter of having a large enough population with a fast enough growth rate enought to ensure progress? I do like your tide pool hypothesis though- being dried out twice daily certainly seems like something that would speed up evolution. Well thats a hell of a way to put it, take every possibility and make it a negative. I'm not a ufo chaser, i think its ignorant to think there aren't other forms of life with intellegence far greater and far less than we. People like you would be sitting on the top of that ignorant reminiscent trash that for some reason runs our assorted countries. Maybe it wont be found, no-one can say for sure, the odds are that if it floated into orbit around an advanced planet, phenomenal. About the same odds that on that planet there will be a pile of ignorant sceptics just like yourself who will be shooting at it hoping that "god" will punish whoever sent soemthing that dictates a change to their way of life. Joel, you seem like an intelligent person, but come on, vitamin C deficiency is PROOF of evolution? What makes you think God couldn't have created these "DNA errors" to fool people like you? "What is so "huh?" about a picture demonstrating that we ingest liquid and solid nutriets through an oriface as opposed to some other method?" Carl Sagan was a brilliant man, as is demonstrated by the body of work he produced and the positive influence he had on others. What's that you say? He smoked the grass? Oh. Then he must be have just been nutty. Because of the grass, you know what it does. It's grass. Grass. Kevin: Regarding the encoding used on the Golden Record. I don't have a link to this at hand, but Sagan actually put a lot of thought into encoding the important information on the disc in such a way that it was agnostic to things like symbolism and base-10 mathematics. I don't know about the encoded images specifically, but if you look on the front of the disc (the one at the top of this page), there are a few carved images that were designed to be solved first. In the upper-left corner is what's supposed to be an electron orbiting a hydrogen nucleus. Below it is a map showing the relative position of Earth to several of the known pulsars in the galaxy. In order to identify the pulsars, their frequencies are noted on the lines pointing to them, in a primitive binary representation (so no base-10 assumptions here), with their periods as multiples of the fundamental frequency of the hydrogen atom (no Earth-centric time unit assumptions). Thus -- so Sagan thought, anyway -- a civilization with a decent understanding of physics might, over several generations anyway, be able to decipher the 'map' and figure out where the probe had come from. I assume similar thought went into things like the encoding of textual, auditory, and graphical data on the other surface of the disk. Anyway, I just think you shouldn't write Sagan off too quickly. He put an almost obscene amount of thought into the creation of the Records, given the odds against anyone ever trying to decipher them. By the way, your photo of "this greenhouse gas nightmare in India" is actually the entrance to the Memorial Bridge in Bangkok. 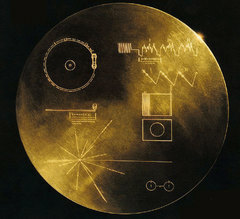 Interesting messages on Voyager, but could it be disinformation and deception in a way to convince us that the government has not already made extensive contact with ETs. why is there no picture of the Great Pyramids? Im not very religous, but who is to say evolution is not God's way of creation? tofrances vitamin c lack was what GOD did to make us mortal after our expulsion from Eden. The Ferengi will sell the disc for a huge profit by claiming it's gold pressed latinum. Science is the "HOW" and Religion is the "WHY"
if you cant see that, in daily life, then you live in a very narrow world. God has a physiology, of some sort...he is bound by the laws of some form of complex physics..when he does something, a chain of events must take place in order for that to be carried out...why couldn't God, have taken our ability to produce Vitamin C away, to encourage our evolution into, what we are today? Just because you understand the "how" does not mean you are capable of comprehending the "why". Thats just arrogant and ignorant. The odds that so many things falling into place to produce galaxies, solar systems, planets, life, cellular structures, atoms, elements, quarks..etc..to such perfection and in perfect synchronization, on it's own, with no outside influence is such a rediculous concept to me, and anyone willing to use any common sense, that to claim our loss of the ability to produce Vitamin C is evidence of Religion and intelligent designs failure, is ludicrous. So how much gold was solid,i mean pure ? was it 24 cart? what was the weight of the disks records ? So how much gold was solid,i mean pure ? was it 24 cart? what was the weight of the disks records ? Geeeeesh , I hope somebody remembered to send a....record player...! It's been so long ago has happened, that phrase long forgotten said: "They(Nasa) put a man on the Moon" but the problem is "We" have not back to the Moon in 37 years or so!, and what we have done to your selves?, getting greedier and discructive and selfishness(that's BIG GREEDY Companies! )and some are not so GREEDY, and start asking your self......WHY? we have not see any PROGRESS?, maybe after 2012 then only then we CAN START GOING TO OUTER SPACE! Frances -YOU’RE WRONG!!! The odds of Voyager being recovered by E.T's are way better than you suggest. An alien race could find it any second!There is no law that intelligent life has to be human like. There is no law that intelligent life has to be based off of DNA. Natural Selection could have produced some vastly different results in the universe. Are you really trying to imply that to have intelligent life evolve a planet has to have one moon and only one moon??? THAT’S LAUGHABLE!!!! You need to read 'The Ancestors Tale' by Richard Dawkins AND Pale Blue Dot by Carl Sagan couldn't hurt either...BTW both audiobooks can be downloaded off of the web in mp3 format. Why do people always refere to God as being a he or a man? Sure Jesus was a man but is god? Maybe God is the force or the presence behind all creation,the light, and the love,that can guide us through anything, and bring everything together in the end. But God does not control our actions, we have to decide for ourselves what is right and what is wrong, with a certain common sense about it. People need to keep an open mind and stop with the hateful,arrogant & ignorant frame of mind. Stop trying to preach what they think are the words of God & think for themselves. People have different views on things but as long as there is Love and Exceptance it doesn't really matter what they are. NO one knows the the meaning of life or what happens in the end until it actually happens. So have Respect & Tolerance for others. Keep your faith, and stand up for yourself but don't try to control or manipulate other peoples beliefs.